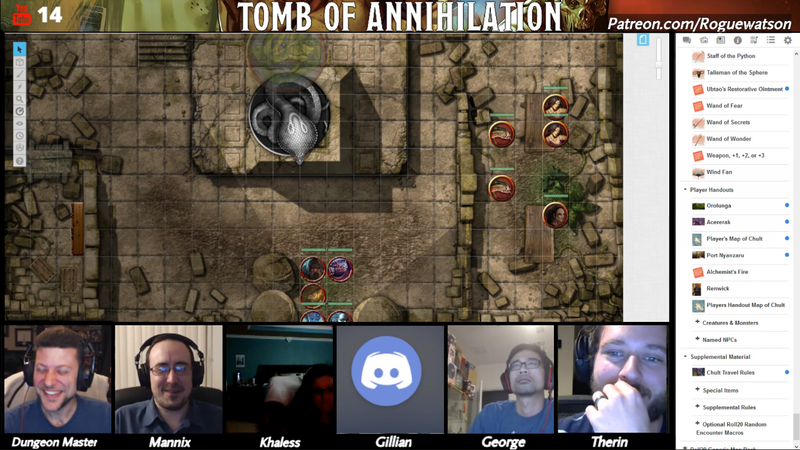 If you’re familiar with Tomb of Annihilation, you may be very confused as to how I’m running Orolunga. There’s a lot I really love about the campaign, but its dungeon ratio (basically none in the first 2/3, then ALL dungeon in the last third) is a little wonky. Without spoiling things too much for my players, I completely rejiggered the location from the book, turning it into a more traditional dungeon crawl. For reference, I heavily based the ziggurat of Orlunga, the only structure that remains, on the Viper’s Pit dungeon by JVC Parry. It’s part of his larger Serpent Isle campaign, which is a fun read that I was even considering running at one point, before Wizards announced Tomb of Annihilation to satisfy my jungle adventures. I had to modify Parry’s dungeon quite a bit as I was using a purchased map from Roll20, and needed to swap out enemies to make it fit in our campaign. The first floor in particular barely resembles the original design at all (save for the snake statue! ), while the second floor is much closer. Orolunga also gives me a fun chance to do some storytelling by including the Yuan-ti, an enemy which is featured more prominently later on in the campaign. First my players had to get there. It was 50 miles to get from where I put the Wreck of the Star Goddess to where I moved Orolunga. I’m a fan of condensing the hexcrawl and moving things closer together. I’m becoming less and less interested in random battle encounters and more about showing off the exotic, interesting elements of the jungle, such as a mysterious meeting with the Aldani, who offer a magical gift to the PCs for their fight against the dead (a Ring of Swimming). You’ve got the lobsterfolk vote, folks! 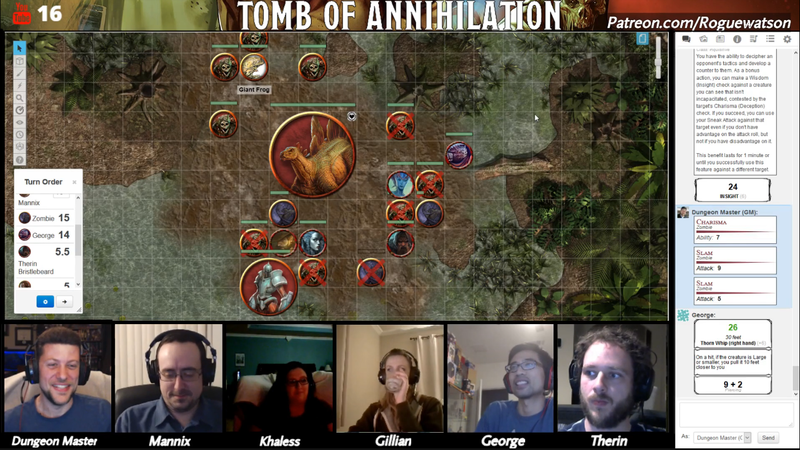 We also had a fun little romp in some mud against some low level undead, as Therin magically befriended a Stegosaurus, and Xandala contacted Mannix to get an update on his search for Artus Cimber. When they arrived at the ziggurat Azaka refused to go inside, saying it was a cursed and evil place. Considering it’s an ancient Yuan-ti temple, she probably ain’t wrong. The PCs let her stay outside, as well as hitching Vorn and the stego while they climbed the stairs to go inside. At the entrance they were greeted by the classic giant monstrous statue trap, in which a stone snake statue sprang to life and attacked. Its stone skin made it last a bit longer (though weak to Gillian’s Shatter spell), but more importantly it attracted the attention of some nearby yuan-ti. I had previously teased a force of yuan-ti moving north through the jungle, when the PCs had visited the friendly lizardfolk ranchers (as well as Artus moving west, then south). They had also found a campsite that had been attacked by a large flying beast, and found a torn up journal with some cryptic information about seeking an oracle. Thus the yuan-ti were fairly recent arrivals, and not happy to see intruders setting off the ancient defenses. A pair of broodguards and a pair of purebloods attacked. Unfortunately the PCs kept making the saves against their Suggestion spells (always a fun spell), but I did get some decent hits with the monstrous broodguards before they fell. One of the purebloods was able to escape through the door by operating the snake head lever. The PCs wanted to immediately go after her, but were understandably cautious about the snake head, sensing that maybe it too was a deterrent against non snakefolk. They attempted to use the severed arm of the dead pureblood to operate it but a dead arm lacks the ability to grab a lever. Khaless reached in, pulled the lever and quickly pulled away (DEX save) to avoid the crushing jaws. As the door slid open, another figure crept up from around the corner that the yuan-ti had emerged from. The party recognized her face as Salida, one of the guides out of Port Nyanzaru, who wasn’t there at the time. They’ll learn her story and explore deeper into the temple next week.